Premium 'Happy Birthday' card featuring divide design and silver foiled detail. 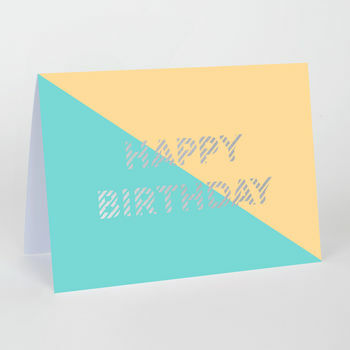 Say 'Happy Brithday' in style, with this pastel coloured greetings card. A recent addition to our bestselling foiled range, our latest offering includes nine new contemporary designs. Perfect for design lovers, this card is printed on FSC certified stock and features a simplistic aesthetic with silver foil detail.